Performance boards offering flexible support for an array of test items. ADVANTEST's rich product lineup of general-purpose performance boards is available quickly, and at low cost. They are useful for a diverse array of applications, including prototype verification and volume production. Flexible and versatile, they also deliver solid performance. ADVANTEST performance board design and manufacture are optimized to specific customer device test needs, based on our long experience and proven track record. We bring improved total cost performance by supplying highly reliable performance boards at low cost and in a timely manner. We have minimized variation in characteristics arising from performance board interconnects, resulting in improved repeatability of test data. Prevention of problems such as wire breakage also contributes to high reliability. Noise reduction is achieved by impedance matching in signal lines, timing accuracy matching, multi-layering to reduce impedance between the power supply and ground, and adding capacitance near device pins. This achievement facilitates test with excellent waveform quality and timing accuracy. ADVANTEST performance boards can support, within tester channel count limitations, impedance matching of ±5%, timing accuracy of ±50 ps, high-pin-count devices with 1,000 or more pins, and devices with pitches of 0.4 mm or less. Thanks to batch manufacturing, which includes application programming, devices can be tested precisely and with high repeatability. Customer application development cycles and manpower requirements are also dramatically reduced. 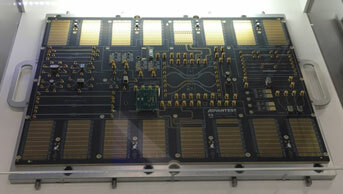 Accuracy required of Performance Board is more higher due to high speed, high density semiconductor devices. We propose solutions by utilizing the board design experience of many years, and support customer's test cost reduction and prompt board design. As an IC tester company, we can conduct precise transmission line simulation, considering the characteristics of Pin electronics module and Device power supply module. 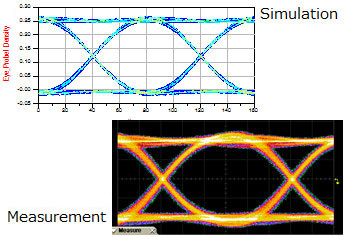 We validate simulation model by confirming correlation with real measurement data.